Daniel Richardson writes about men and women who hold onto, or return to, one thought or desire with unusual strength and persistence. A rhinoceros stands for this sort of single mindedness. 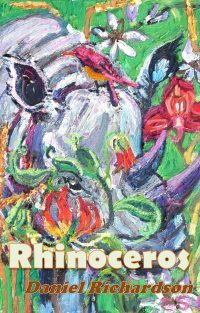 In this collection, we meet Wei Lin, a kind of Chinese Rhinoceros, and Archie Katz – a Rhinoceros in Love – among others. In a deceptively low-key style that builds in intensity (or absurdity), Richardson portrays the stubborn pachyderms who live amongst us, crashing through life’s flowers in their determined pursuit of all-encompassing goals.